19" wide x 12 1/4" deep x 66 3/4" high. 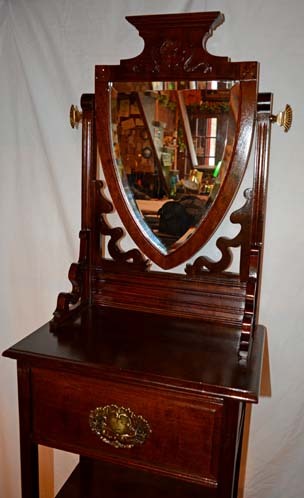 Here is a Cherry Stand with Mirror that is a show stopper! This Eastlake style stand (circa 1880) has the original stamped brass hardware on the single dovetailed drawer. There are two handy shelves beneath this topped with cabriole legs. The mirror is beveled and is held in place by two original brass mirror hangers. This is an elegant stand that deserves a special spot in your home.